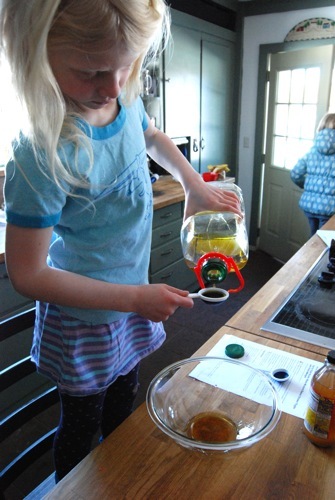 Welcome to DAY TWO of Cooking with Kids! on The Daily Dish. Today’s recipe comes courtesy of Serious Eats, a fantastic website I discovered through Twitter. I’ve only been on Twitter 3 weeks and to be honest, still don’t know a # from an @ from a tinyURL. 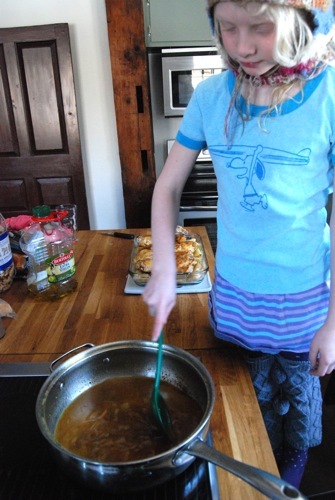 But the site is such an enormous resource of recipes, talent and networking, it’s amazing! Today’s recipe was touted as a bargain meal (Eat for Eight Bucks) which attracted the budget conscious momma in me, but it’s so much more. 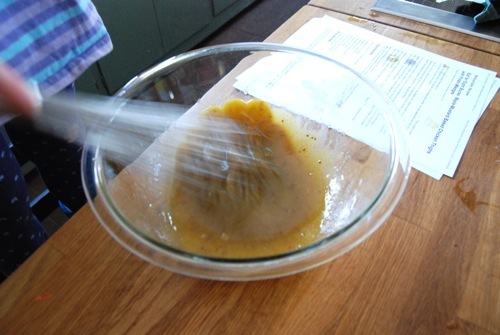 The marinade, a mix of maple syrup, mustard and cider vinegar, is used three times. First to steep the chicken pre-cooking, second to act as a braising liquid during baking, and last as an accompanying serving sauce. The resulting meal has a level of flavor almost unheard of in salt free cooking. To say it’s DELICIOUS (all caps) is an understatement. But as great as its flavor is its simplicity. What better way to emphasize this than by preparing it with my 7 year old daughter? Despite her young age, my youngest is a real foodie. 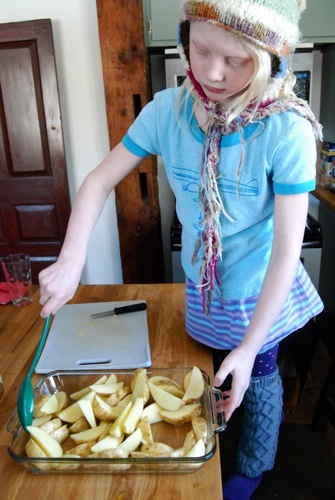 Eager to create, eager to eat, and always up for a (supervised) challenge. With a little help from her momma, she did it! Today’s recipe is our tastiest low sodium collaboration yet. In a bowl large enough to hold the chicken, combine the vinegar, maple syrup, 2 T. olive oil, mustard and freshly ground black pepper to taste. 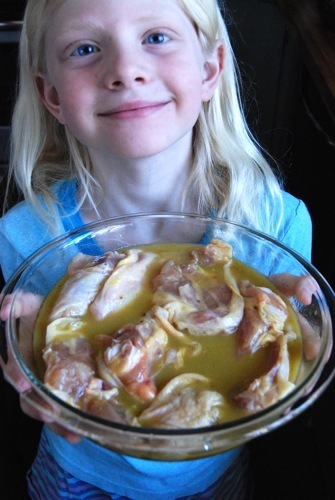 Add the chicken thighs to the bowl and toss to coat with the marinade. Cover with plastic wrap and refrigerate 2-3 hours. When ready to prepare the meal, preheat the oven to 350°F. 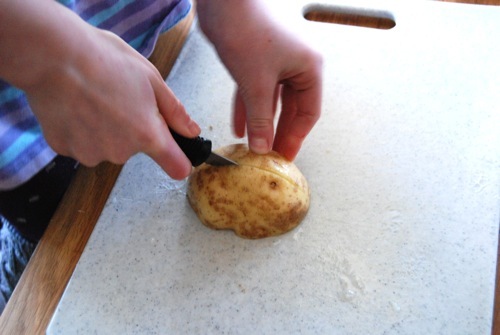 Cut the potatoes into 8 wedges each (fewer if the potatoes are small). Place the wedges in a 9 x 13-inch baking dish and add 2 tablespoons olive oil. Toss until well coated. Place pan on middle rack in oven and bake 15 minutes, until the wedges are beginning to cook but definitely not done. Remove from oven and set aside. Raise the oven temperature to 400 degrees. 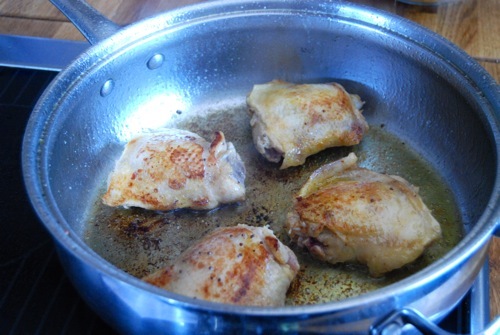 Place a large frying or saute pan over high heat and add 2 T. olive oil. Once oil is hot, cook the chicken. (NOTE: The oil splatters when hot, so this is NOT a step for children!) First let any excess marinade drip off the chicken, then place each piece skin side down. Cook for 3 minutes, until the skin is brown and comes off the pan easily, then flip the chicken and cook another 2-3 minutes on the second side. Remove the chicken from the pan and place on top of the potato wedges. 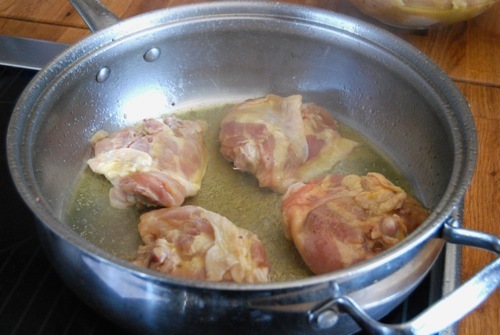 Once all of the chicken is browned, pour the marinade and 4 T. white wine into the frying pan and bring to a simmer, scraping the bottom of the pan to get up all the cooking bits. Once everything is up, pour the mixture over the chicken and the potatoes. Place the pan on the middle rack in the (now 400 degree!) 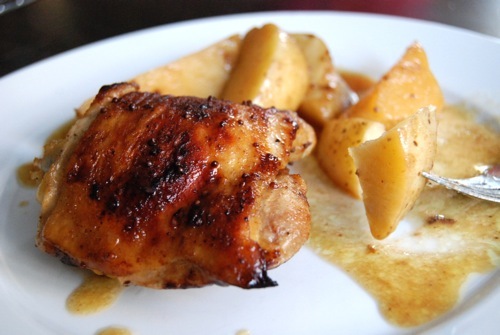 oven and roast approximately 30 minutes, until the potatoes are fully cooked and the juices from the chicken run clear. (If you’re unsure, cut into the chicken to check. It should no longer be pink.) Remove the pan from the oven and serve immediately. Hey Georgia, GREAT JOB and I love your outfit! Do you have any poisonous snakes or spiders? That kid is too freakin’ angelic. And funny! I especially love the winter hat as hairnet. Lovely ladies, Georgia sends her thanks for the compliments. Both the girls have their own sense of style and unless something’s inappropriate (for me that means hoochie mama) I just let them go w/ it. 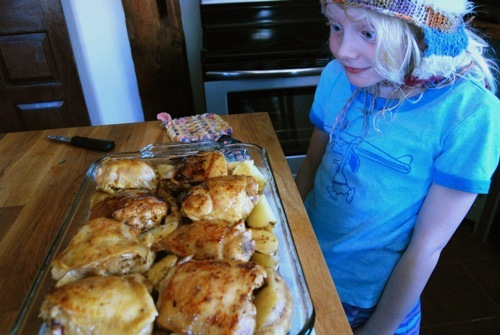 The look often involves tee shirts and winter hats – this time also happened to help keep hair out of the chicken. WIN-WIN. Hi! This looks good! I’m making it for another family tonight and it will need to be reheated, or at the last stages of being cooked when I drop it off (there will be a lag time of a few hours between when I make it and when they’ll eat it). Any thoughts on if I should just cook it all the way? 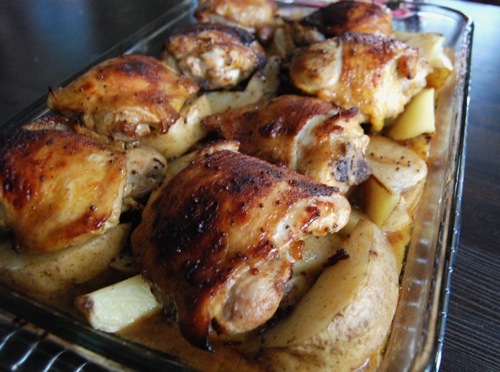 or should I stop in the middle of the recipe (say before the marinade is poured over the chicken and potatoes for the last part of the cooking)? I’d love your suggestions. Thanks! Hi Joan, I would recommend cooking it fully, simply for convenience. 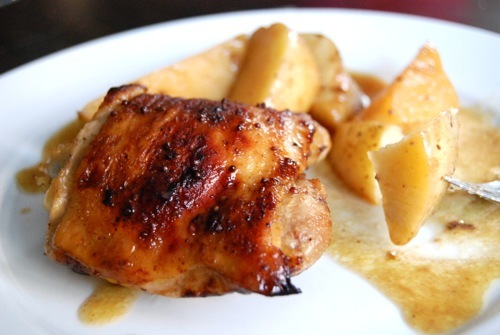 Because of the marinade, the chicken stays very moist, so there’s no need to worry about the meat drying out in the “off time” – nor should it be a problem to reheat. Save yourself extra hassle, wondering how long to cook it – or your lucky recipients having to do any work at all. Just follow the recipe as written and wait for the compliments! Thanks for the quick reply! I’m making it for my family tonight too, so I’m looking forward to it as well! Awesome Joan – hope you enjoy it as much as we did!! Hi, looks delicious. Can I also use boneless chicken thighs? We all hate getting it off the bone and leave about half of the meat on…what is actually the reason for using on the bone? Sorry, maybe very silly question….